← New ePub and PDF Reader Updates Now Available! I’ve always heard the saying that there are two things in life that are certain: death and taxes. This week being the deadline for tax returns in the US means this is likely ringing true to many of you right about now. In addition to these two certainties, there is one more event that seems inevitable in work life… Meetings. While meetings are a necessary part of getting things done, I find them even more difficult to plan and execute in school or campus settings. When individuals are working in different buildings with different schedules it sometimes feels impossible to get everyone in one place to gain consensus on a topic. That’s where Google Hangouts come in. A Google Hangout is an all in one instant messaging/video conferencing/screen sharing tool that has the potential to replace many of the face-to-face meetings individuals are accustomed to. We have been using it often here at Texthelp and have found it very useful in many settings. In this post I will be sharing some specifics on how you too can get the most out of this free tool. In order to use Hangouts you will need a Google account. You can then download Hangouts to your Computer, Android, or Apple device from the appropriate store (i.e. iTunes for Apple devices). Once installed you can start a Hangout with a contact you already have in your contact list or invite others. The screenshot below is what appeared after I clicked “Start a Hangout” from my Google+ page. As you can see it resembles the screen that appears when sharing a Google Document. Anyone you enter in the “send an invite” box will get an invitation and be able to join your Hangout. Another super easy way to start a Hangout is through Google Calendar. When you create a new event, you can choose to include a link to a video call (see image below). Individuals who you invite to the event will be able to click and join the meeting at the scheduled time. You can have up to 10 individuals join your Hangout. This includes video conferencing capabilities, meaning that if participants have a webcam you will be able to see them during the meeting (don’t worry, you can always turn off your webcam). Hangouts attempt to be smart, so the person talking shows up full screen while others are in smaller windows at the bottom of the screen. You will find that this doesn’t always work as expected however. If someone coughs, types on the keyboard, or makes other noises the system will sometimes show that person full screen instead of the person talking. To prevent this anyone not talking can easily mute or un-mute themselves as needed. You can easily switch to screen-share so that individuals see your screen as opposed to your webcam view. It integrates nicely with Google Drive, so that you can easily pull documents into the Hangout. Many times this is preferred over screen-sharing because everyone can be looking at the same document and still see each other. It also integrates nicely will other Google Apps (Calendar, Gmail, etc…). For example, if using the chat feature, your chat history can be searched via gmail. 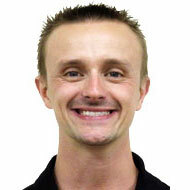 This makes Hangouts the go to solution for Google Apps for Education users. Need more than 10 people to join your Hangout? 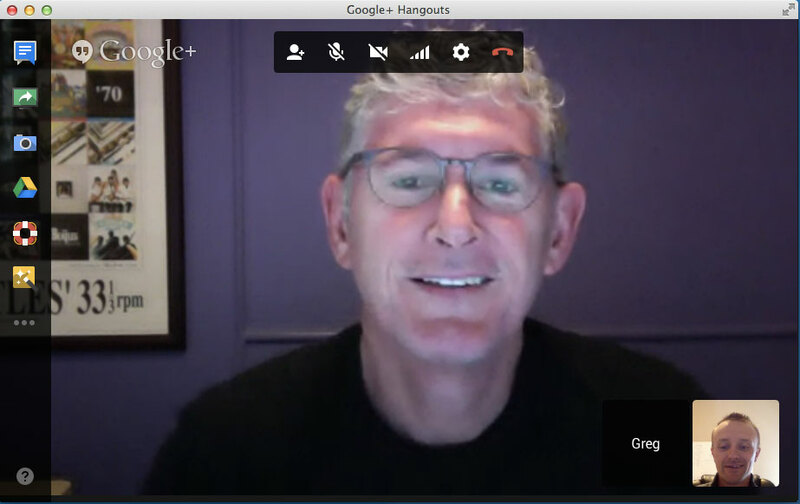 No problem… Google also has Hangouts on Air (or HOA for short). Basically Hangouts on Air allow you to schedule an event and invite participants, then when you are ready to broadcast as many people as you would like can join in and watch. While the limit of 10 is still in place for those that can talk and be seen via a webcam, an unlimited number of people can attend. In addition, after the Hangout on Air is complete, you can make a recording available and share with those that couldn’t make it to the live event. This is great for announcements, training events, and more! Save time. If meeting attendees are scattered across a school district or campus, the time required to travel to and from a meeting can easily exceed the time needed for the actual meeting. Save space. Finding an available space to meet is not always easy. Many designated meeting areas have a two week wait (or more) just to schedule a time slot. With Hangouts, attendees can be in their office, at home, or even join in on their smartphone from anywhere in between. Get more done. Face to face meetings always encourage additional conversation, snacks, and other non-essential items that can increase the length of meetings. While this is nice on occasions, holding Hangouts helps to keep attendees on task and less likely to fall behind on other work. Be creative. While meetings may be the number one reason you choose to use a Hangout, I’ve seen them used for everything from providing large scale training to conducting classroom or student observations. I’ve even heard of Grandparents who use Hangouts to watch Grandkids open presents across the country. 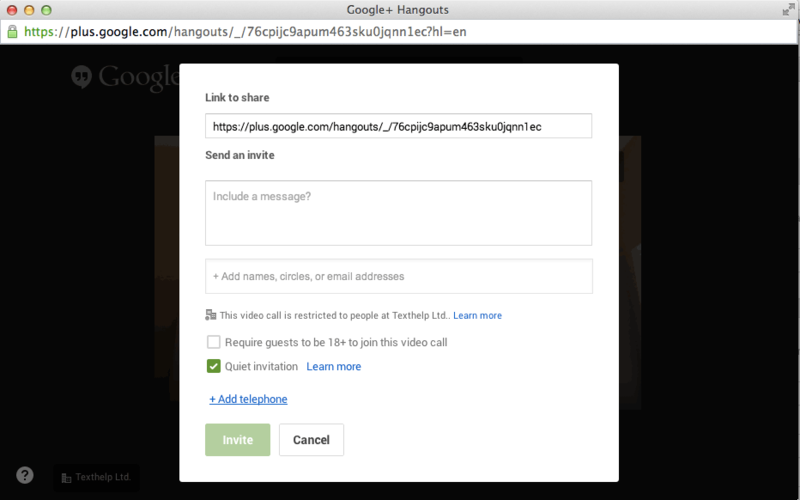 Now that you know a little more about Google Hangouts it’s up to you to schedule one. I would love to hear how you plan to use a Hangout (or are already using Hangouts) in the comments section below! Also, a special thanks to Greg O’Connor for agreeing to join a Hangout last minute so that I could grab a screenshot for this post.